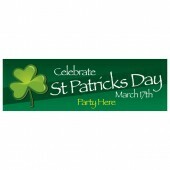 St Patrick’s Day is a big event which has the potential to bring in a lot of extra revenue for all kinds of businesses. 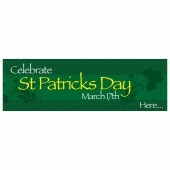 Discount Banners offers a great selection of St Patrick’s Day Banners to help you advertise your St Patrick’s offers and promotions. 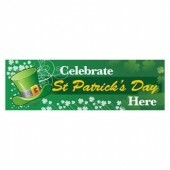 Whether you’re a pub, bar, shop or are holding a party we have a St Patrick’s Day Banner to suit your needs. 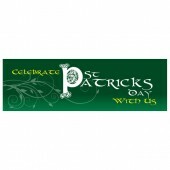 If you would like to adapt or personalise one of our St Patrick’s Day Banners then contact one of the team on 0844 800 1020 Our St Patrick’s Day Banners are available in either 8’x2’ or 10’x3’. All of our St Patrick’s Day Banners are printed on high quality weather resistant PVC and use eco-friendly UV stable inks so that you have a stunning, full colour St Patrick’s Day Banner that lasts. 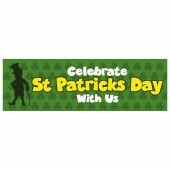 Your St Patrick’s Day Banner will be with you 2-5 days after your order has been placed.